June is here and summer is on its way! Join us for some fun fitness events to kick off your healthy lifestyle this month. From small online group fitness classes to a Global Running Day celebration, there is something for everyone! If you're a runner, you don't want to miss out on how you can become part of the podcast on Global Running Day 2018 and win something special for helping us inspire our listeners. Don't miss your chance to try out a new running app, if you can run with us in Hermosa Beach and to log your Charity Miles with our team to make a difference while you work out! Be a part of the podcast! Head HERE to record your 1-3 minute notes on why you love running and what running means to you to inspire listeners. Send it to Podcast@FitArmadillo.com by Tuesday, June 5th at 5 PM PST. BONUS: The 1st five to do so will get a special thank you gift! Log your miles through the Charity Miles App (HERE) under team @FitArmadillo to make a difference while you work out. Can you make it to Hermosa Beach? Test out the LiveK Running app by running one of 3 routes that will be mapped out along the Hermosa Beach strand. 3. Fit Armadillo will be back at the Hermosa Beach Pier Farmer's Market on Wednesday, June 20th. Learn more about the company and register for the fun run to get a sparkly finisher's medal. Details HERE. 4. Our Women's Fitness + Business Retreat happens in August and early bird pricing ends June 15th. Save your spot HERE. Look for a Virtual Retreat planning day by signing up for my A-List HERE. Be sure to read Deena Kator's book so you can send in your questions before I chat with her in a few weeks. Head HERE to get it. 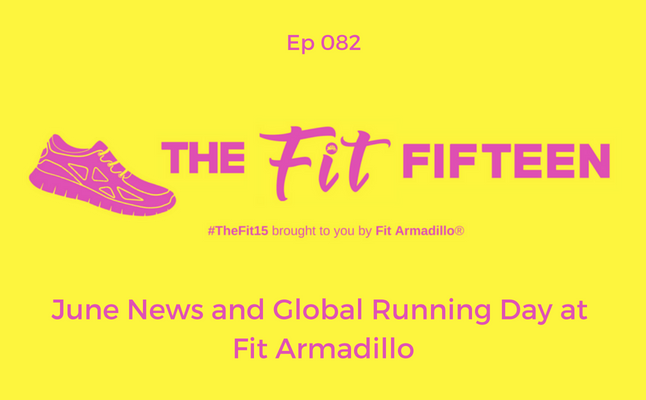 Lots of #FitnessFun happening in June @FitArmadillo #PodcastShow @TheFitFifteen's sponsor. Join us for a #HomeWorkout, #GlobalRunningDay and more!